"The Last Supper" Plate with Heirloom Rose Trim - 1831 Discounts Apply ! 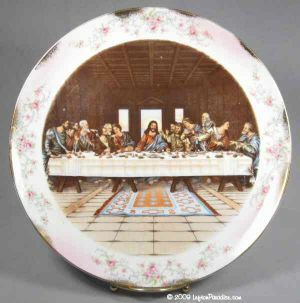 A beautiful plate with a transfer design depicting "The Last Supper" by Leonardo daVinci. The edge is rimmed with Heirloom Rose. The flawless plate is 10½" in diameter and is marked 1831 and has the Lefton color crown logo and Lefton sticker.